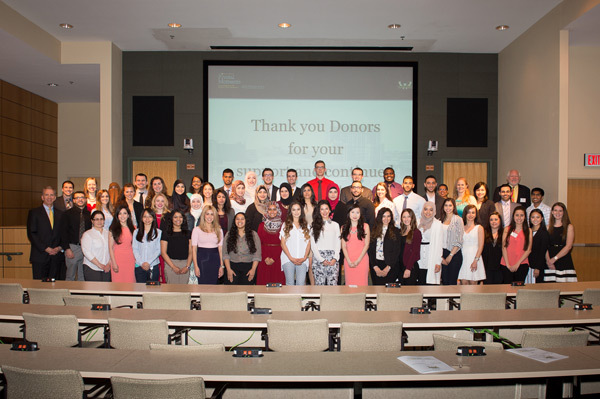 The Eugene Applebaum College of Pharmacy and Health Sciences hosted its annual Donors and Scholars Luncheon in May. The event recognized donors for their generous contributions in support of scholarships and honored students for their academic, community and leadership activities. Because of the continued commitment and kindness of donors, the college presented more than $222,000 in financial assistance to 146 students. Beverly Schmoll (physical therapy, ’67), donor and former dean of the college, delivered remarks focused on the joy of giving during the program for students in the health sciences. One of the college’s biggest supporters, Schmoll contributed to the newly created Academic Leadership Endowed Scholarship and established the Physical Therapy Founders Endowment, which provides funding for students to attend conferences. Schmoll encouraged students to give back so they could also experience the happiness associated with helping others. Professor Emerita Geralynn B. Smith discussed the importance of paying it forward in her comments during the ceremony for students in pharmacy programs. “Pay it forward— to respond to a person's kindness to oneself by being kind to someone else — can be applied to scholarship recipients and the scholarship donors. This phrase unquestionably describes my personal story. As the beneficiary of a scholarship as undergraduate college student, I have a firsthand understanding of value of scholarships in assisting me in attaining my degree in pharmacy,” said Smith. “As scholarship donors, my husband and I desire to support students in achieving their academic goals by helping them financially and we would hope that our recipients would view us as role models and follow our example, so they too will pay It forward in the future." Nurse anesthesia student Oluwaseyi Lawal, recipient of the EACPHS Board of Visitors Annual Scholarship and EACPHS Diversity Advisory Board endowed scholarships, and second-year Doctor of Pharmacy student Nour Ghamrawi, recipient of the Arab American Pharmacists Association, Nazih Jawad Life Rx, and Kmart Pharmacy endowed scholarships, also expressed their gratitude to donors during their speeches. Throughout the program and lunch, students’ messages of appreciation were displayed on digital signs throughout the college. Many thanked donors for allowing them to focus on academics instead of worrying about their rising student loan debt or working multiple jobs or longer hours to pay tuition. For more information about supporting scholarships or establishing a named scholarship at the college, please contact Denise Thomas, director of philanthropy and alumni affairs, at ew8458@wayne.edu or 313-577-1095. View the photo albums from the Donors and Scholars events here. More than $222,000 was awarded to 146 students at the annual Donors and Scholars luncheon in May.